98 pages | 26 B/W Illus. 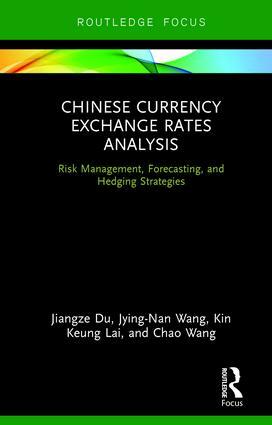 This book provides an overview of Chinese RMB exchange markets and its risk management strategies. The view that RMB is playing an increasingly international role has been widely accepted by practitioners as well as scholars worldwide. Moreover, the Chinese government is opening the control of RMB exchange market step by step. However, some related topics are under heated debate, such as how to manage and warn of the currency crisis, what the trend of RMB exchange rate in the future is, and how to hedge the exchange risk in the process of RMB internationalization. In this book, we will give distinct answers to the above questions. Jiangze Du is currently Assistant Professor of Jiangxi University of Finance and Economics in China. He obtained his PhD degree in Management Sciences from City University of Hong Kong in 2015. He specializes in financial time series analysis and financial risk management. Jying-Nan Wang is currently Professor of Chongqing University of Posts and Telecommunications in China. He obtained his PhD degree in Graduate School of Management, Yuan Ze University in 2008. Dr. Wang’s research interests are in market microstructure, volatility estimation, and risk management. Kin Keung Lai received his PhD at Michigan State University, USA. He is currently the Chair Professor of Management Science at the City University of Hong Kong. Professor Lai’s main areas of research are operations and supply chain management, financial and business risk analysis. Chao Wang is currently a Ph.D. candidate in Department of Management Sciences at City University of Hong Kong. He received his Master Degree of from Texas A&M University, USA. Chao Wang’s main research areas are financial time series analysis and financial risk management.